Discover the man who showed the world who's boss in a new trailer & teaser poster from director Kevin Connolly's Gotti. Starring John Travolta as infamous crime boss John Gotti, the upcoming true story about the most notorious gangster of our generation opens in select theaters & on demand December 15. 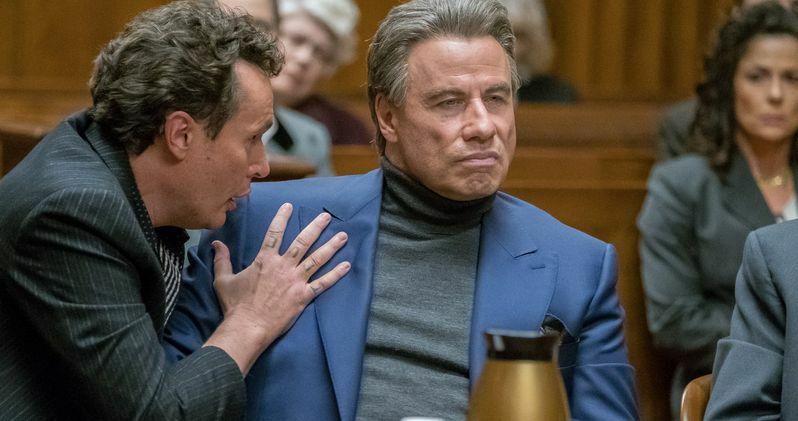 After years in development, fans finally get to see what John Travolta looks like as the infamous John Gotti. Gotti follows crime boss John Gotti's (John Travolta) rise to become the "Teflon Don" of the Gambino Crime Family in New York City. Spanning three decades and recounted by his son John Jr. (Spencer Lofranco), Gotti examines Gotti's tumultuous life as he and his wife (Kelly Preston) attempt to hold the family together amongst tragedy and multiple prison sentences. The film will be released by Lionsgate Premiere in theaters and on demand on December 15, 2017, with the trailer debuting on Lionsgate YouTube today. We first reported on this project more than six years ago, with reports surfacing in late January 2011 that John Travolta was circling this John Gotti biopic. As the project moved forward, there was talk of reality star Kim Kardashian being eyed to play Kim Gotti, the daughter-in-law of the title character, while Lindsey Lohan was eyed to play Victoria Gotti, John's daughter. That character named after his wife, also Victoria Gotti, who will now be played by Kelly Preston, John Travolta's real wife. At one point, directors such as Nick Cassavettes and Barry Levinson were attached to direct, but those incarnations never got off the ground. In August 2011, the casting process was still ongoing, with Ben Foster coming aboard to play John Gotti Jr., and Chazz Palminteri playing mafia boss Paul Castellano, roles that are now being played by Spencer Lofranco and Donald John Volpenhein, respectively. While it looked like the cast was coming together, production never started, although a report surfaced in 2013 that Joe Johnston was coming aboard to direct from a script by Leo Rossi and Lem Dobbs, based on a story by the mobster's son John Gotti Jr. The last we heard of the project was in May 2013, when Anthony Hopkins was signing on in an unspecified role, but he's no longer involved with the project. The supporting cast includes Pruitt Taylor Vince as Angelo Ruggiero, Stacy Keach as Neil Dellacroce, Meagan Leonard as Kim Gotti, William DeMeo as Sammy Gravano and Ella Bleu Travolta as Angel Gotti. Gotti is a crime drama directed by Kevin Connolly and written by Leo Rossi and Lem Dobbs. The film is produced by Randall Emmett, George Furla, Marc Fiore and Michael Froch. Along with the trailer, we have the first poster and photo from Gotti, which you can take a look at below.